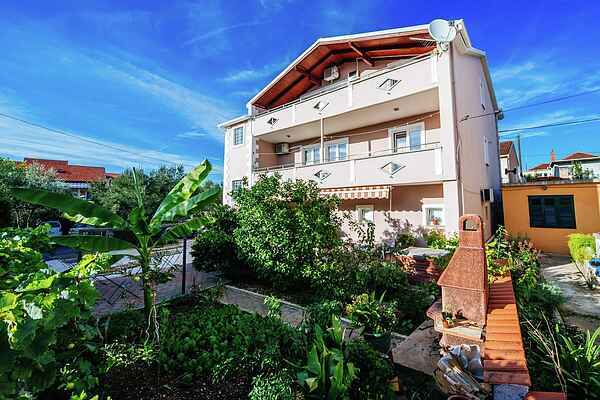 Apartment Grande Rustico is situated in Bibinje, a small tourist town next to Zadar and only 6 km away from Zadar airport. Your apartment is consisted of 2 separate units connected with spacious 30 square meters covered terrace. Both units are located on the ground floor and have private entrance. Apartment for 5 people decorated in a rustic style with stone and wood dominating in interiour design is bigger apartment with large living/dining room and 2 bedrooms.Few steps away is the entrance to the modern studio suitable for 2 persons. You are welcome to use the barbeque for home cooking! Also, the owner is offering service of breakfast and meals prepared using home made products. A pebbled beach is located 200 meters from the apartment. Bibinje has 4 km of coast with various beaches suitable for adults and children. Within the distance of 200 meters you will find beaches, store, caffes, restaurants and much more. Zadar, a city of exceptional history and rich cultural heritage is only 6 km away. Both in Bibinje and Zadar you can enjoy local restaurants where you will find tasty local dishes. Next to walking and cycling, Bibinje is also suitable for surfing and windsurfing. The local diving centre organizes diving courses and diving excursions. In 1 Day trip you could visit 2 Nature parks as well as 4 National parks: Kornati islands, Plitvice lakes, Krka and famous climbing center Paklenica. Such natural beauties launche Zadar region at the very top of Croatian tourist offer!